It is common for tax systems in both advanced and developing countries to grant tax concessions to certain consumers and producers. The budgetary cost of these concessions is referred to as “tax expenditures.” They are a kind of expenditure because governments forgo revenues by granting concessions that are not part of the regular tax system. These concessions take several forms. Income generated in a region or sector may not be taxed at all or taxed at a reduced rate. Taxpayers may get targeted allowances to lower their tax liability, or defer payment of taxes, and/or receive exemptions from payment of import duties or taxes on domestic production. In some advanced countries, it is a legal requirement to estimate tax expenditures annually. In other countries (including a few emerging markets), such estimates are produced only periodically. In recent years, there has been a growing interest among finance ministers of developing countries to ascertain the magnitude of tax expenditures in their countries. The reason is understandable: they are under pressure to mobilize more taxes from domestic sources, but they are unaware of the cost of tax expenditures since multiple ministries and agencies grant concessions. For example, tax incentives for promoting investment—which are part of the broader concept of tax expenditures—are granted by various ministries, such as petroleum, investment, industry, and tourism, and there is no central authority that keeps track of them. I argue that more light should be shined on tax expenditures in developing countries through their regular estimation and publication. This would make a large “spending” component more transparent for taxpayers and the international community and facilitate an informed debate on the costs and benefits of tax expenditures. From the perspective of public policy, tax expenditures should be as cost effective as any spending program in the budget. 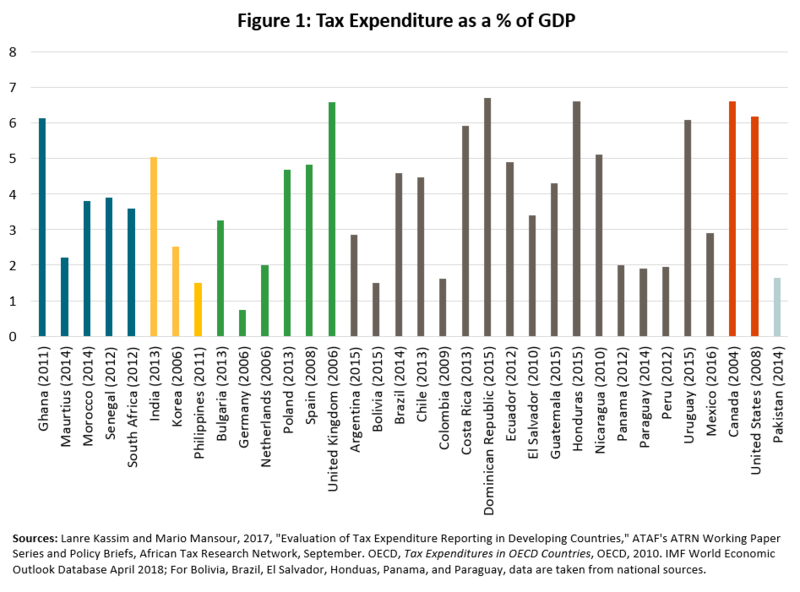 Figures 1 and 2 present tax expenditures as a percent of GDP and total tax revenues, respectively, for 34 countries as compiled from various sources. Although these estimates are not directly comparable because countries use different methodologies to calculate tax expenditure, they nevertheless confirm that many governments, both in advanced and developing economies, are giving away large sums of money through tax concessions. In one-third of the sample countries, tax expenditures are 5 percent of GDP or more. And there are four countries—Ghana, Costa Rica, Dominican Republic, and Guatemala—where they top 40 percent of collected revenues! In general, tax expenditures harm the efficiency and effectiveness of a tax system. But not all tax concessions are detrimental to the economy. For example, tax credits for research and development—when properly administered—can generate positive gains for the economy. They narrow the tax base. This is an important concern in countries where the tax base is already compressed because of large informal and agricultural sectors. Tax expenditures create inequities across taxpayers as those with similar incomes and assets end up paying different levels of taxes. Tax expenditures invite corruption since several exemptions tend to be discretionary, encouraging officials to grant concessions in exchange for a bribe. Benefits from tax preferences accrue disproportionately to middle- and high-income households, thereby contributing to income inequality. By lowering the revenue take, they further limit the government’s capacity to spend on inequality-reducing programs. Tax expenditures have been found to be redundant in attracting foreign investment. Many investors have reported that they would have invested in a country anyway and tax incentives were not crucial determinant in their decision. Tax expenditures tend to be less transparent than a typical (direct) spending program in the annual budget, which is debated by the parliament. They thus permit “spending” that is outside the agreed-upon budget. 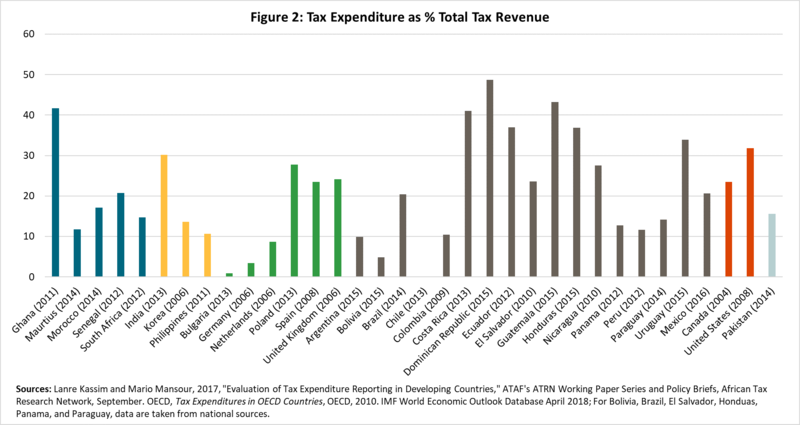 Despite their shortcomings, tax expenditures are unlikely to be eliminated any time soon and will remain part of the tax systems of both advanced and developing countries. That said, it is important that all developing countries estimate and publish tax expenditures regularly to facilitate an assessment of their costs and benefits. This will enhance the transparency of government operations with beneficial consequences for general governance in a country. The number of countries reporting tax expenditures has risen over time. According to the Open Budget Partnership, 47 countries out of the total 102 surveyed in 2017 reported tax expenditures. In the 2015 survey, only 13 countries did so. With 16 countries in the above sample, Latin America is leading in reporting tax expenditures. This is a positive development, but a large number of countries in Africa and Asia are lagging in reporting tax expenditures. And even if increasing numbers of countries are reporting their tax expenditures, it does not mean that these countries have begun to streamline them. Even if countries wished to calculate and report their tax expenditures, many lack the capacity to do so. International organizations such as the IMF and World Bank and donors who have committed to scale up their capacity-building efforts under the Addis Ababa Action Agenda should step in and offer support. A country’s technical assistance program supported by them should not only include an appraisal of tax expenditures but also strengthening of local capacity to prepare such estimates. To give greater credibility to the exercise, international organizations should propose a robust framework for estimating tax expenditures to prevent governments from underreporting them, while recognizing that going forward, tax concessions in personal and consumption taxes (such as the value-added tax) are likely to assume greater importance. All agencies and ministries responsible for granting tax concessions must coordinate their activities under the leadership of the minister of finance. The budget law should require the regular publication of tax expenditures. Discretion to grant tax concessions should be taken away by embedding them into the law. Countries should move to tax concessions that are viewed by tax experts to be more cost effective (e.g., accelerated depreciation and investment incentives). Undoubtedly, this is a tall order. But if developing countries are serious about collecting more taxes from domestic sources to fund social programs and infrastructure, action on tax expenditures will have to be a key component of this strategy. Discussion on tax and development can be incoherent, both within and between different sectors. A symptom of this is the tendency for inflated expectations about the scale of revenues at stake in relation to multinational corporations and misunderstandings and contested definitions on the issue of illicit financial flows.